Hanna is the station captain’s pampered daughter; Nik the reluctant member of a notorious crime family. But while the pair are struggling with the realities of life aboard the galaxy’s most boring space station, little do they know that Kady Grant and the Hypatia are headed right toward Heimdall, carrying news of the Kerenza invasion. When an elite BeiTech strike team invades the station, Hanna and Nik are thrown together to defend their home. Worthy sequel. Gemina picks up where Illuminae left off and offers fresh conflicts at the same page-turning pace as it’s predecessor. The new characters are just as interesting as Ezra and Kady with clear talents, goals, and personalities. Hanna’s drawings. I wanted more of these! They were a nice touch to the otherwise tech-focused format. Nik’s backstory. Very well-done and worth a mention. Certain plot points felt a tad repetitive to the previous book, but there was enough fresh material that it didn’t bother me. Five stars. Can Obsidio come out like NOW? This series is so well-done. I love it! This morning, Kady thought breaking up with Ezra was the hardest thing she’d have to do. This afternoon, her planet was invaded. But their problems are just getting started. A deadly plague has broken out and is mutating, with terrifying results; the fleet’s AI, which should be protecting them, may actually be their enemy; and nobody in charge will say what’s really going on. As Kady hacks into a tangled web of data to find the truth, it’s clear only one person can help her bring it all to light: the ex-boyfriend she swore she’d never speak to again. Format. The format of the story is NOT a gimmick. This story could ONLY be told through this collection of documents. A traditional format just wouldn’t work. That’s all I can say without giving away key plot points! Fast-Pace. Despite the book’s chunky size, this story moves at a breakneck pace. The book is nearly impossible to put down. High stakes and shocking twists. These authors raise the stakes to an almost impossible level. Just when you think things have gotten as bad as they can get–things get worse. Highly recommend this book! You should go in knowing as little about the story as possible. But what an emotional roller coaster! A masterful work of sci-fi storytelling! The format wasn’t a gimmick, but purposeful and perfectly suited to the the story it was telling. LOVE. THIS. BOOK. 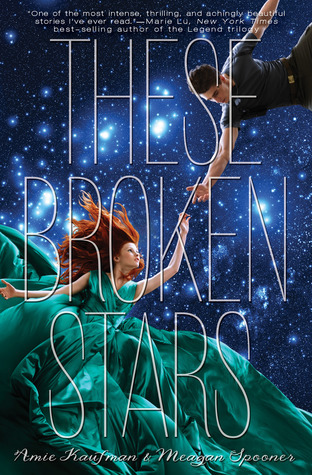 This book is a sequel/companion book to These Broken Stars. While it is not necessary to read the books in order because the books follow different characters, it is recommended. 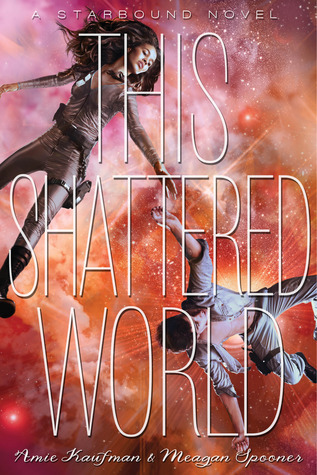 This book takes place on a planet on the verge of war. Soldiers are trying to keep the peace, but a mysterious mental illness is causing the soldiers to go crazy with violence. History between the soldiers and citizens/natives is tense to say the least, and tension is rising. Jubilee Chase is one of the soldiers. Flynn Cormac is one of the native rebels. But in this story reminiscent of Romeo and Juliet, Jubilee and Flynn see something in each other beyond their side in this war. Initially, I really enjoyed figuring out all the ties to Romeo and Juliet. I enjoyed trying to figure out character equivalents and where the story was going. I also really liked the bits of Irish culture embedded in a setting that was otherworldly. This element grounded the story as well as gave the reader something to grasp in a setting that was unfamiliar. I liked the idea of Jubilee Chase, being a hardened soldier after a tragic childhood. I liked the Shakespearean place names: Avon, Verona, etc. I liked the home of the rebels and how they managed to stay hidden. The swampy setting was very original and fresh. The ending helped pull the book together. This book was much slower for me than These Broken Stars. I really struggled to finish it. Jubilee and Flynn did not come to life for me like Tarver and Lilac. I think part of the problem for me was buying into their skills and talents as characters. I would have bought into Jubilee being a tough as nails if we had actually gotten to see her in battle. I would have bought into Flynn being a rebel leader more if we had actually seen him navigating his people through a challenge. In the previous book, Tarver and Lilac underwent so much when they crash landed that we saw their character through the hardships they went through. I didn’t feel like this book had the same level of conflict and challenge. Instead, it felt a lot more like Jubilee and Flynn were observing and hiding and talking for most of the book. I also didn’t really like the direction the book took being so similar to the previous one. I get that it was the author’s attempt to tie the books together, but it didn’t feel fresh to me. It felt forced. I would have preferred that the authors use this new planet setting to create a new conflict. I also felt like the whole first half of the book was a tad confusing. I didn’t understand what was meant by the soldier’s going insane (I think we needed to witness that firsthand earlier in the book). I didn’t understand all the dreams at the start of each chapter. Looking back, I still don’t like how many dreams there were, and even now knowing what their purpose was, I don’t want to go back and reread them. I didn’t like that Jubilee and Flynn both didn’t die. I felt like it was a bit of a cop out. I was expecting it with the parallel Romeo and Juliet storyline. I’d prepared myself for it. And then it didn’t happen. And I totally felt like the authors wimped out. Wanted their characters to have a happy ending. And so they didn’t kill them. And I think it might have been a better story if they’d died. Three stars. Not as good as These Broken Stars. Slow, didn’t like the characters as much, and weaker in plot. But still creative sci-fi and I enjoyed the ties to Romeo and Juliet. Lilac LaRoux and Tarver Merendsen are from two different worlds. Lilac is a socialite and focus of the paparazzi as the daughter of the wealthiest man in the universe. Tarver worked his way up in the world as a military hero. When their spaceship, the ill-named Icarus, is thrown from hyperspace and crashes on an uninhabited planet. Lilac and Tarver are forced to depend on each other for support and survival in a wild, mysterious setting where social class means nothing and anything–even love–is possible. Totally Fresh and Original: This book didn’t feel like it was trying to be like any other book out there. It felt fresh. As I read, it felt like diving into something fun and different. The book is described as Rose and Jack from Titanic, but where the ship sinks in the first five minutes, and then they land on the island from LOST. So yes, there are hints of ideas we’ve seen before: poor boy loves rich girl, post-crash survival story, and mysterious setting. Despite those familiar elements, the authors pulled off making this something entirely new and original. Between this book, Marissa Meyer’s Lunar Chronicles, and Beth Revis’ Across the Universe series, I think YA science fiction is showing great mainstream potential. Unpredictable Plot: The twists and turns in this book were exceptional. There were many, many parts of the book where I wasn’t sure what was going on. Without spoiling anything, I will say that the elements that were similar to a ghost story were completely unexpected and a pleasant twist. Slow, Authentic Romance: It takes a really, really long time for Tarver and Lilac to admit any sort of feelings for each other. I enjoyed getting to know them as individual characters, especially since the book switches back and forth between both of their voices. That dual perspective allowed readers insight into what each character respected about the other. For example, Tarver is in awe of Lilac’s determination, though he does not express this to her. Seeing how both characters grow to respect and admire each other was a refreshing perspective in teen romance. Five Stars. I just thoroughly enjoyed this book. I can definitely see myself picking it up to re-read one day. Highly recommend!